I think this one may be my favorite selfish sewing item yet. I really really really like it. A lot. Did I mention I like it? 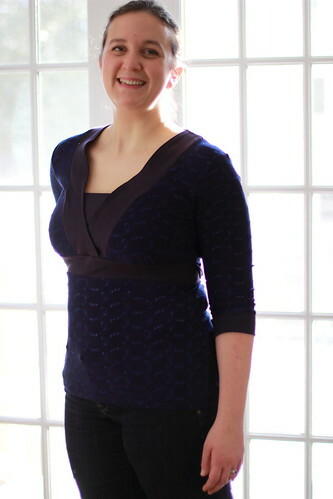 I used navy blue embroidered polyester jersey for the body and sleeves and navy organic cotton interlock for the neckline, waist band/tie, and sleeve bands, all from fabric.com. The polyester has been in my stash for over a year. I bought it despite the fiber content (I like natural fibers better) because of the color and embroidery. It feels heavy and has a lot of drape. 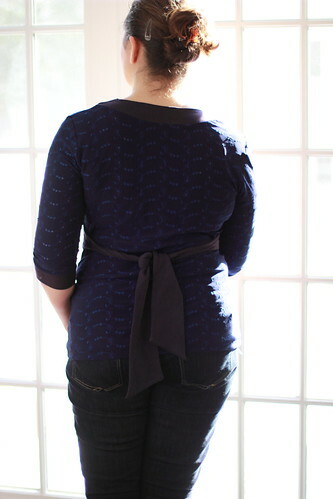 The interlock is more stable and helps the neckline stay put, I think. I was going to underline the whole thing with some navy rayon/spandex blend jersey but the blues were clashing a little. Besides, I realized that the eyelets weren’t causing any see-through issues. I still have to adjust the differential feed on the serger it would seem. My sample seams were nice but I guess a little bit of stretch was still happening since there’s a tiny bit of a ripple in the neckline band. Over all though, the fit is great and this top makes me happy. It will definitely be in regular rotation in my wardrobe! Seriously, my recent successes have made me want to make all the Jalie patterns. Except for the skating costumes, I guess. The instructions are very concise but complete. No handholding here but I can’t say I’ve found anything lacking either. I’m no expert seamstress yet I understand everything I’m supposed to do. Patterns are printed on thick paper and the sizes go from a child’s 2 to a women’s 22. I highly recommend these patterns. Apart from my top, I’ve finished designing the hat for souricette 1. Which means I got to buy the fabric I really wanted to get! The knitting machine is having tantrums again though so no hat for now. I hope to get it done before Winter is over but. Project Run and Play is starting soon and I’ll be sewing along. My head is full of what I want to make and I’ve bought/ordered everything I need. I’m not going to be able to concentrate on that hat until I’ve gotten through those 4 projects. Mr. Mouse is already dreading the stressed out mess I’ll be in January. But I’ll be using my creativity and problem solving to create my visions so I’ll be a happy stressed out mess! ‹ Photo Monday – Snow!